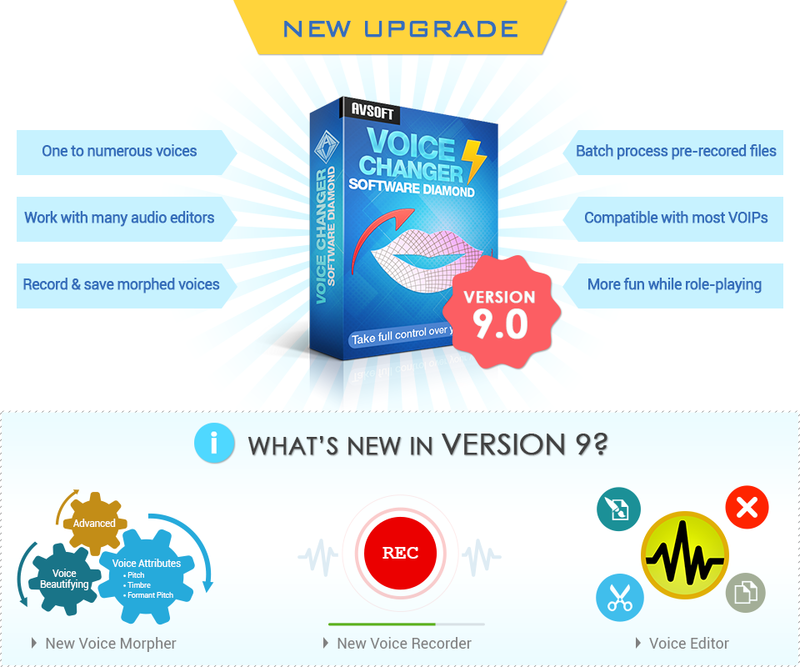 The smartest Voice Changer Software, discovering the cutting-edge voice changing technology. Grab The Look. 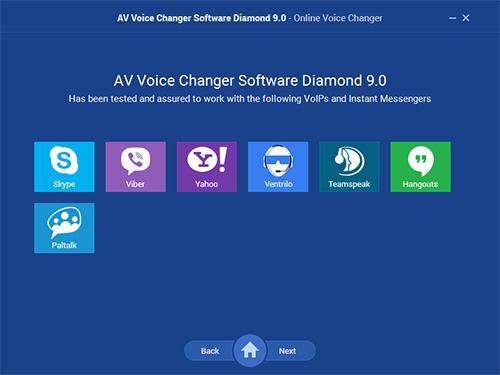 AV Voice Changer Software Diamond - A first look! 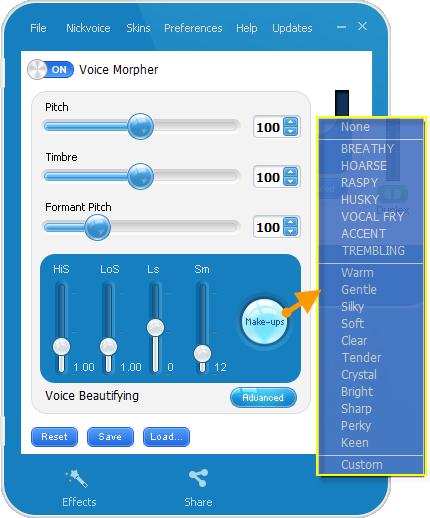 The smartest Voice Changer Software, discovering the cutting-edge voice changing technology. 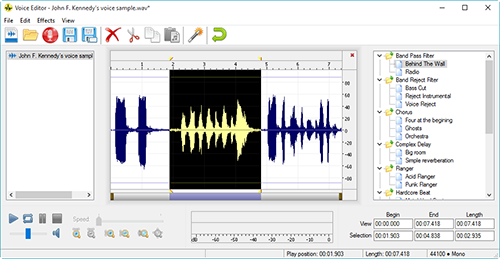 Just wait for a minute: If you want to buy full PRO Voice Changer Software, please use this link to get 40% OFF. Only for this site visitor. 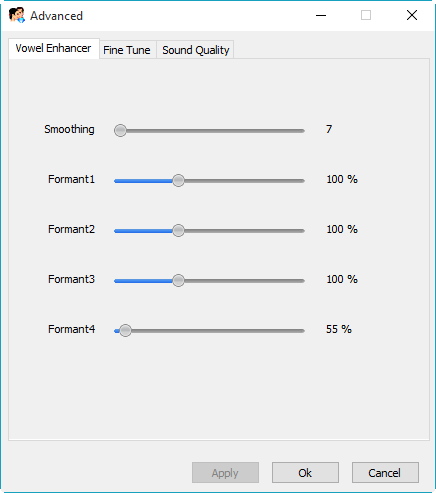 Vowel Enhancer, Fine Tune, Sound Quality module is used to limit the permissible value of the processed signal amplitude and to lessen all the background noises while leaving useful signal for the most part intact. 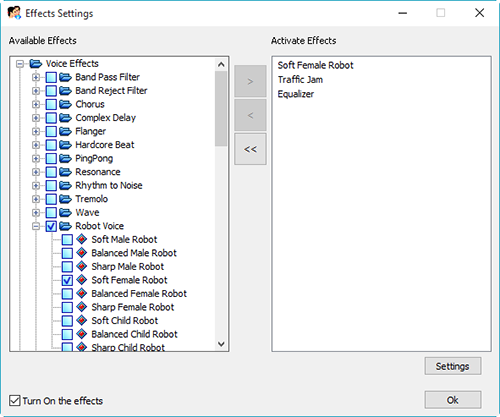 Vowel Enhancer adds harmonic changes to fix out-of-tune notes or changes key of singing voice without affecting timbre and pitch. The order and the form characteristics of a spectral make up to 80% of the character of a human voice timbre and pronunciation individuality. 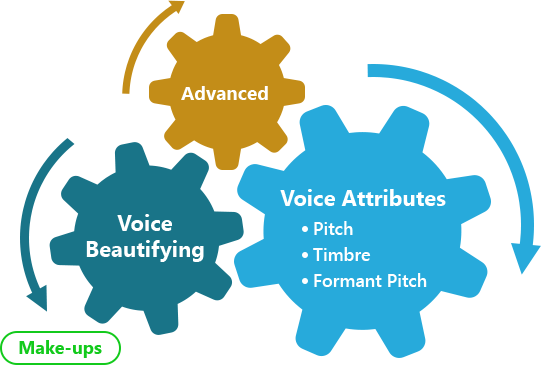 VCSD Voice Morpher module makes changes on these characteristics of voice. 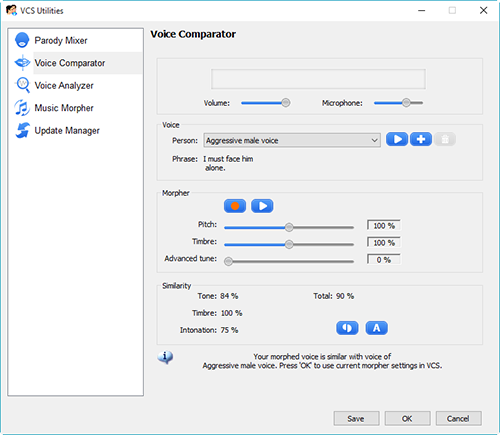 VCS Diamond has its own sound Recorder which makes it easy for you to record and save conversations, morphed voice messages, convert audio file format, as well as modified songs. 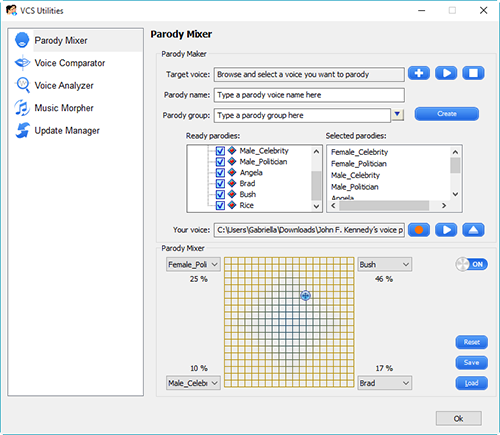 Parody Mixer allows you to mix different voices together to create a new voice, to mimic the voice of a certain person and save the voice for later use. 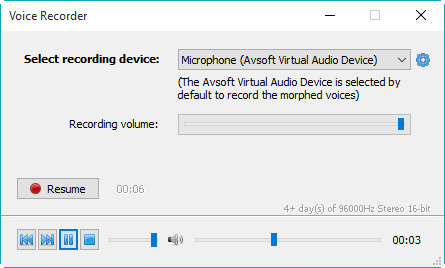 You can mix up to 4 different voices chosen from the built-in list. A voice made by Parody Mixer is called a parody. 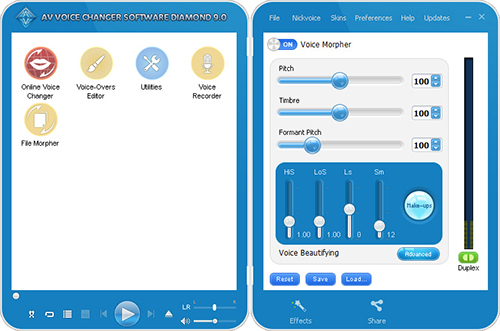 Voice Changer Software Diamond has a library of more than 30 real-time audio effects divided into 11 groups. 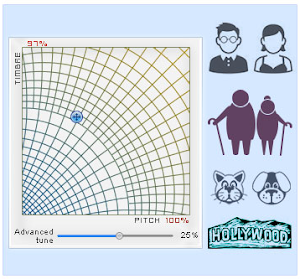 You may also compare your voice with non-human voice sounds. 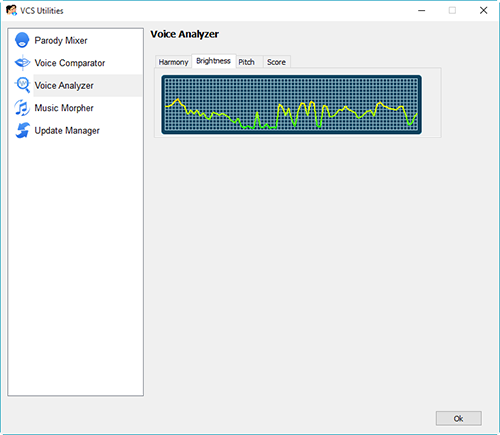 To use Voice Comparator, click the Comparator button on the main panel. 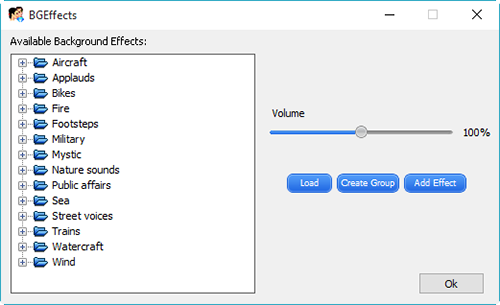 Background effect is a kind of sound which serves as a background for your voice in the appropriate situation or place you would like to be. 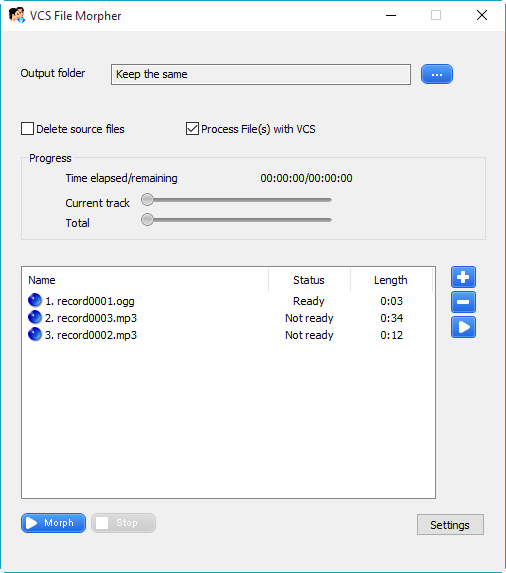 VCS Diamond supports many kinds of audio file format to be played as background sound: .mp3, .wav, .wma, etc.